Hey there. All you bright investors out there!!! Welcome to today’s article. 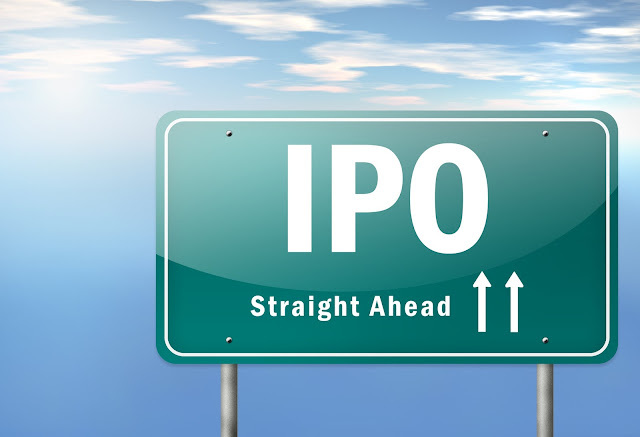 It’s raining IPOs here and we are meeting yet another IPO which is open from 17th June 2017 to 21st June 2017. Yes friends the IPO we are gonna discuss today is Eris Lifesciences Ltd. So let’s see if it’s a thumps up or a thumps down!!! Eris is a company venturing in Pharma products of select therapeutic areas within the chronic and acute categories of the IPM, such as: cardiovascular; anti-diabetics; vitamins; gastroenterology; and anti-invectives’. It’s focusing on developing products in the chronic and acute category which are linked to lifestyle related disorders. The company had around 56 mother brand groups as on 31.03.2016. It has its owned manufacturing facility in Assam. However some of the products are outsourced. Since it’s a sale from of the shareholders stake, no proceeds will be received by the company. 2. Eris is a zero debt company as on 30.09.2016. 3. 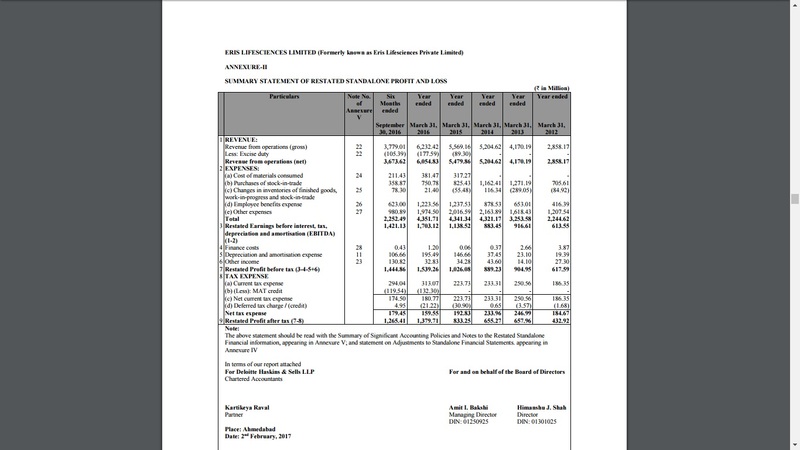 Its revenue base is Rs 605.48 Crs for the FY 2015-16 of which profit works out to Rs 123.54 which is approx 21% of sales. 4. Now the networth as on 31.03.2016 was Rs 305.73 Crs. Isn’t it awesome that the shareholders funds is earning more than 41% return. So the growth of this company seems to be exponential. 5. 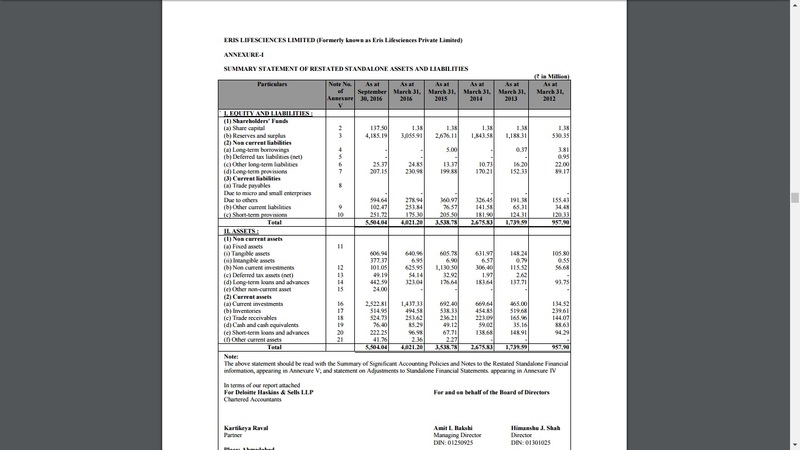 As on 30.09.2016 the company has a good asset base with a net block of Rs 98.43 Crs. 6. Now not to discourage the company’s strategies but the company has a market exposure in the form of mutual funds for more than 256 Crs. Well I personally would say it’s a very good strategy. But that’s just me. 7. The company’s inventory turnover ratio is more than 12 times and its debtor turnover ratio is more than 23 times. Now that’s called working capital management. Another very important aspect to consider is that more than 60% of its revenue comes from domestic markets. So not much worries about FDA. 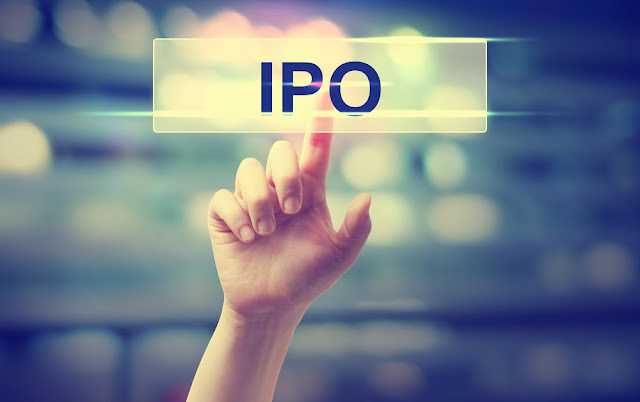 The offer is at a price band of Rs 600 to 603 for shares with a face value of Rs 1/-. A single lot would consist of 24 Shares. As per the weighted average EPS for past 3 years which works out to be Rs 7.83 on standalone basis. This implies that the PE is 77 which is heavily overvalued. 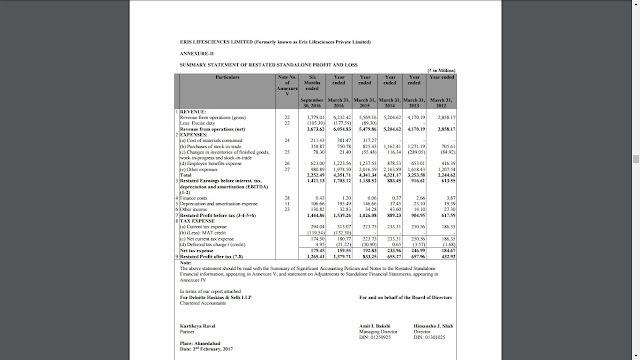 Now looking into only 6 month ended on Sep 2016 the company is claiming the EPS to be 9.20 thereby implying the annualised EPS to be at 18.40 and thereby the PE to be at 33. I am not sure if the second half year will have the same returns as the first one. Even if it was I would say the valuation is not at a discount but at par with it intrinsic value. Now had the proceeds gone to the company it would have been sure buy. However since the proceeds are not going to the company the price is pretty much high. Let’s see another IPO that came before Eris from the same sector. 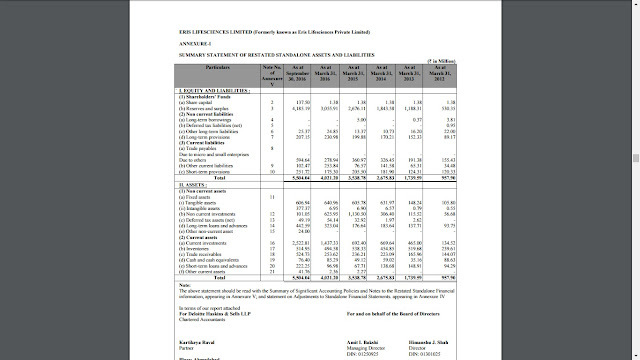 Laural Labs had EPS of Rs 17.92 basic on standalone basis. Its price band was Rs 426 to Rs 428. That’s PE of around 24 times. Now its trading at Rs 603 which is a PE of around 34. Therefore considering these facts there are some other pharma companies which are worth investing and having a very low PE compared to Eris. Some suggestions are Divis Labs, Aurobindo Pharma, Piramal Enterprises and Glenmark Pharma. Therefore as of now I would say avoid Eris. Had the price been reasonable the company was a sure buy. Keep reading !!!! Enjoy investing!!! !